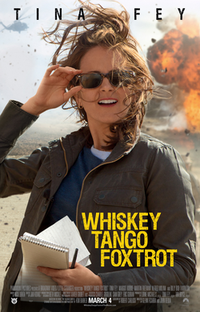 Whiskey Tango Foxtrot is a 2016 American war comedy film directed by Glenn Ficarra and John Requa, and written by Robert Carlock, based on the memoir The Taliban Shuffle: Strange Days in Afghanistan and Pakistan by Kim Barker. The film stars Tina Fey, Margot Robbie, Martin Freeman, Christopher Abbott, Alfred Molina and Billy Bob Thornton. It was released on March 4, 2016 by Paramount Pictures. This webpage uses material from the Wikipedia article "Whiskey_Tango_Foxtrot_%28film%29" and is licensed under the GNU Free Documentation License. Reality TV World is not responsible for any errors or omissions the Wikipedia article may contain.